West Chester Galleries are comprised of two gallery spaces (Huston and Allinson Galleries), which display regional and local artwork for sale and/or simply to view. Housing great artwork 9 months of the year supports our mission to inspire the community to and through art. Members’ All Media | Non-Juried Group Show | ARTISTS, view entry details HERE. Self-Portraiture | Juried Group Show | ARTISTS, view entry details HERE. The Lion Sleeps | Non-Juried Group Show | ARTISTS, view entry details HERE. Stillness | Juried Group Show | ARTISTS, view entry details HERE. Set the Table | Non-Juried Group Show | ARTISTS, view entry details HERE. Con”text”ual Art | Juried Group Show | ARTISTS, view entry details HERE. Before the Fall | Non-Juried Group Show | ARTISTS, view entry details HERE. CCAA’s SHOPArt will exhibit ceramic art exclusively. It is a new version of Clay Days that will leverage our gift shop space. The work of each artist will be grouped within the shop, so the sense of unity and clarity we had last year will continue. 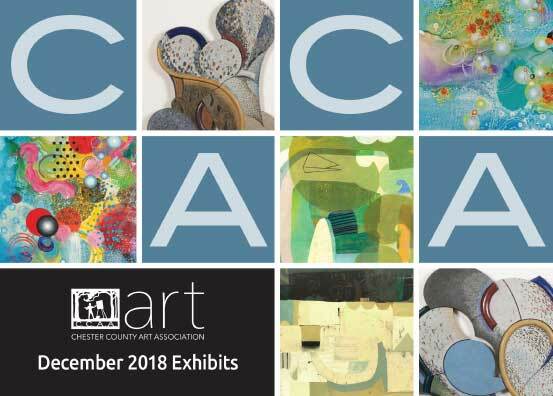 Clay Days 2018 will also benefit from two opening receptions, First Friday Gallery Walk on Friday, October 5, and CCAA’s October exhibit receptions on Thursday, October 11. The gift shop space will not permit the display of quite as many pieces as the weekend show did, but artists will have the opportunity replenish as items are sold. CCAA will showcase a selection of work from our past solo artists as well as past/current artist-teachers of CCAA. This fundraising event will provide the community an opportunity to bid, in silent auction format, on each artwork. All artworks will be offered at a reduced rate, and bidding will continue from the opening reception on 10/11 through the closing reception on 11/1. At the closing reception a small live auction will be held and the silent auction winners will be announced. The Silent Auction event will provide funding for CCAA's many programs, and the community will have the opportunity to acquire quality art from established artists in our community. Click to read great article about all 3 October exhibits! The Barnes on Bradford | Juried Group Show| ARTISTS, view entry details HERE. Most of us have taken notice of the renewed vibrancy of the Barnes Foundation which has utilized its new site for exciting shows. There is no denying, however, the irresistible appeal of the permanent collection, with its vast array of works by Matisse, Cezanne, Renoir and other renowned artists of the 19th and 20th centuries. Steel Designs: One length of the metal wall art may not exceed 14”. The other length is not restricted. Among museums, the Barnes has the unique addition of wrought iron metal works which Albert C. Barnes collected and hung interspersed with his abundant painting collection. Paintings inspired by or in the manner of the artists of the Barnes collection, including but not limited to Cezanne, Gauguin, Matisse, Modigliani, Picasso, and Van Gogh. All submitted works must be framed. Up-cycled Leather in Art | Juried Group Show | ARTISTS, view entry details HERE. $300 and Under |Non-Juried Group Show NEW | ARTISTS, view entry details HERE. To promote the show the artists have hidden clay critters, claytons, claydohs, and gremlins throughout the county! See what I mean by going to our Instagram page here. Be sure to visit the show at WCU too! View details here and visit Saturday, October 7th at the E.O. Bull Center for the Arts, Room 162, 12:00-2:00pm Mary Cloonan will demonstrate her figurative building techniques as well as her approach to unique surfaces. 2:30-4:30pm Rebecca Coffman will demonstrate throwing functional vessels on the potter's wheel. Church Street Gallery will host artist, Marisa Boryd, ons display at Church Street Friday, 10/6 and Saturday, 10/7. Private family collection of Chester County artists. On the Road: Physical, Spiritual and Philosophical Journeys | Non-Juried Group Show award judge is Kelicia Pitts. Ms. Pitts Graduated from Moore College of Art with a degree in Curatorial Studies (minor in Business and Fine Art Media) currently works at Delaware College of Art and Design. View the award winners here. Lobby pop up (CCAA and Barclay Friends) 9/7 reception 5-7pm at CCAA . 9/8 through 9/22 at Barclay Friends. Special video premiere The Arts in Chester County by Emily Herman. Saturday, May 13th at 5:30 PM guest speaker, artist P. Buckley Moss (click the file below to read about her) will be at CCAA as part of an alumni event hosted by Virginia Tech. Show Catalog of Artists HERE. The power of saturated color, in small amounts or great, will be showcased in the exhibition. Join Time Light Art March 4, 2 to 4 PM for a panel discussion. The panel will discuss various aspects that are related to the works on display; selection of themes, composition, camera techniques, prints quality, matting and framing, even title choices. Panel members will discuss their favorite pieces and also ask the authors to share their insights with the audience. Input and questions from the audience are welcome! Moderator: Lin Tan. Some artwork defies academic rules, displays challenging juxtapositions, or depicts unexpected subject matter- but they work! Show us your artwork that is uncommonly attractive.